Elvie Ancheta took over the administrative reins of the William J. “Pete” Knight Veterans’ Home in Lancaster, Calif., after former administrator Norman Andrews retired. Elvie Ancheta is the director of the William J. “Pete” Knight Veterans Home in Lancaster, Calif.
She enjoys working at the home and with the resident veterans. “I have so much respect and compassion for what they’ve been through,” she says. “I have a soft spot in my heart for older folks because my grandparents raised me. I see their faces in the veterans I work with here,” she said. Working with the resident vets, in a way, is like a chance to take care of her grandparents. While she values the benefits of the quality and well-rounded education her grandparents wanted for her, she sometimes feels that her time in school was time taken away that could have been spent with them while they were alive. 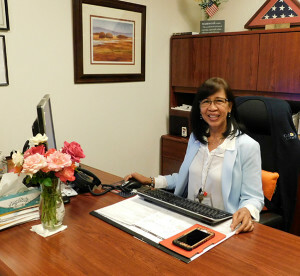 As administrator for the home, Ancheta is responsible for overseeing all nine departments that operate the facility, to ensure each department is running smoothly and offer insight and help when needed. A huge plus for the resident vets is Ancheta’s critical care skills. “As we get older we sometimes run into critical issues. I’m very comfortable with that. I’m not intimidated by that at all,” she said. Currently Ancheta says she is focused on changes in the surrounding community environment. “I’m dedicated to keeping our residents safe,” she said. For starters, she has tightened security measures that give home officials more control over who enters and leaves the facility. She and her team are also working on emergency plans that will help keep the residents safe during any kind of unexpected disaster, natural or manmade. Ancheta says the home is a good place for local veterans who just need a little help with some things, “Otherwise they would be struggling out there,” she said. And that look of fulfillment is obvious as Ancheta can be seen walking around the facility greeting residents and making sure they feel at home. Often when an establishment gets a new leader, a period of concern about the future follows. Not so when Ancheta took over the reins said Lawrence Hawkins, the home’s supervising rehabilitation therapist. “Elvie had been working at the home for about three years before taking over — she knows all the residents, they know and like her, which made for a confident and smooth transition,” Hawkins said. “We have a great service here for our veterans,” Ancheta said. She fears that not enough veterans are aware of the facility and what it has to offer them. She hopes the news of the home spreads so that any California veteran who may be having a difficult time on their own is aware of the William J. “Pete” Knight Veterans Home in Lancaster and the services offered there.